Maybe you've got some torrent movies or video clips in AVI format, or some family AVI footages from your digital camcorders saved on your Mac's hard drive. But you soon realized that they're unplayable since the Mac built-in player - QuickTime cannot recognize the AVI format at all! So you might have come up against a brick wall trying to discover if it is possible to play .avi format films on Mac computer, or iPhone iPad. Some web sources say it can't been done; while others reckon it's possible only if converting AVI to MP4 with a superb free Mac video converting software. Convert 1080p/720p HD, or SD AVI videos to MP4 format on Macbook Pro/Air, iMac etc. within 3 steps. 100% Free; No Adware; No Malware! Why Do You Convert AVI to MP4 on Mac? Yes, there are various reasons that users convert AVI to MP4 on Mac computer, instead of MKV, FLV, MOV etc. But in a nutshell, it can be concluded into Mac video playback, uploading, storage, formats compatibilty issues. Let's go in details. To play AVI on Mac directly on Quicktime player is always a hot topic. Since Quicktime have no access for AVI videos, only you convert AVI to MP4, can you play it on Mac without any hassle. Throughout YouTube, FB, Dailymotion etc., which allows you to upload AVI videos directly? None. Converting AVI to MP4, or or other YouTube video format is always the initial step for uploading. Compared with AVI, MP4 is much samller at the same qulity, taking up less storage space on Mac. If you're precisely obsessed with this, why not compress large-size video avi to smaller MP4? Owing to MP4's wide compatibilty, Mac users prefer to convert AVI to MP4 and add them to iTunes/iCloud, so that they can directly watch on Macbook, iMac, iPhone iPad iPod etc. AVI developed by Microsoft, in DivX, Xvid, Cinepak, Indeo, DV or Motion JPEG codec. Pros: Compatible with Microsoft devices, game console including Xbox, PS3, PSP. MP4 developed by MPEG, in AVC MPEG-4 and H.264 video codecs. Pros: Great compatibility with devices; Sharing on the web and streaming over internet; Better compression ratio with smaller size and good quality. Cons: MP4 with H.264 codec poses problems with editing as it contains more B/P frames. Faced on the issue that iPhone iPad and Quicktime won't play AVI files, you're suggested to convert AVI to MP4 on Mac since the MP4 format is identified as one of the default formats by Apple's gadgets and other devices as well. And as you cruise related forums, you may notice that a wholesome of users demand of freeware to get AVI to MP4 conversion done on macOS. But the only real problem is that some hum and haw halfway or disappoint you when it comes to speed and conversion quality in the tests of converting AVI to MP4 format on Mac. Fortunately, we picked up a totally free AVI to MP4 video converter - macXvideo that works for AVI to MP4 conversion on Mac (including the latest 10.13 macOS High Sierra). It paves the way with intuitive features that go well beyond other competitors in any mainstream yet free video conversion with no ads, spyware, watermark, etc. It supports any video format like AVI, FLV, WMV, MKV, MTS, etc as input and is in favor of freely converting any video to MP4, MOV, WMV, etc on Mac in a fraction of seconds. Convert all standard video formats including AVI, MPEG, MP4, MOV, FLV etc. 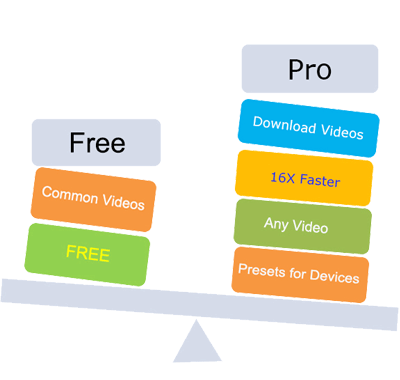 Free convert HD, even 4K UHD video, MKV, AVCHD, H.264/AVC, H.265 etc. Play HD and SD Videos on iPhone iPad iPod and Android devices. Excellent editing features like trim/crop video, add effect & subtitle to video. Step 1: Free download this AVI to MP4 converter freeware on Mac, run it and click "Add File" button to load your AVI file you desire to convert. Step 2: To convert AVI video to MP4 format on Mac, simply select the target MP4 Video format at the bootom of the window. The optimized default settings ensure the best output quality. Step 3: Specify an output folder on your computer to save the output files. Click the "Folder" button to choose the path where you want to save the output files in. Step 4: Click the "RUN" button at the lower right corner of the interface to begin to convert AVI to MP4 on Mac OS X. Despite the freeware provides a fabulous yet free AVI to MP4 converting solution for Mac, some bonus extras you'd like to have shall not be missed out. And the paid program called MacX Video Converter Pro will be definitely worthy of your trying and is the best around for sure. Convert HD videos to a wide range of formats, such as MKV to MP4, WMV to MOV, H.265 to H.264, MTS to MP4, FLV to AVI, AVI to DVD, MP4 to MP3, etc. Convert AVI to MP4 on Mac at blazing fast speed with excellent quality. Only 23 seconds for a 5 min HD AVI video converting to MP4. Compatible with the latest macOS (High) Sierra, El Capitan. At the mention of converting videos for free, online AVI to MP4 converter is absolutely another wide choice. There is no limit on platforms, both Mac and Windows users can enjoy a smooth AVI to MP4 conversion with fast speed and not bad quality. But online AVI files converter for Mac is also criticized to be not stable and safe enough. There is a big possibility that your AVI to MP4 conversion crashes midway or your computer gets infected with virus, adware or malware. Anyway, all these happens on condition that you pick up a weaker online tool. You're free from all these problems if you rely on a reliable online AVI to MP4 converter, such as Zamzar, Free Online Video Converter, Convertio etc. Step 1: Load AVI files. Select files from Computer, Google Drive, Dropbox, URL or by dragging it on the page. 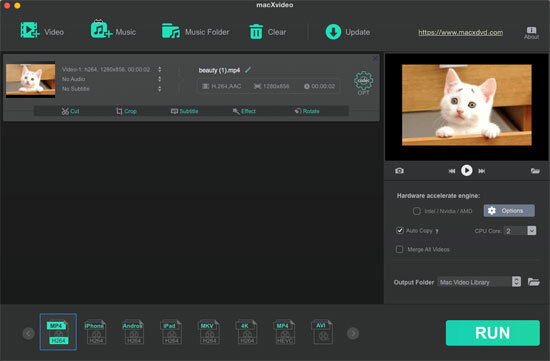 macXvideo supports to free convert AVI to MP4, MKV to FLV MP4, MOV files on Mac/Windows with no adware or spyware for playback on QuickTime player and iPhone, iPad, iPod, Android phones and tablets.